I know I’m not alone in scouring the net for images of beauty to inspire me. I love nothing more than coming across a visual that makes me stop dead in my tracks and just… absorb. A recent one that spoke to my makeup-loving heart was one of Givenchy‘s Spring campaign images. The eyes, the lips… the pink, the orange… even the wispy hair… just perfect! Another of my favourites and instantly recognisable. Sonya Kukainis embodies the natural, polished beauty that BECCA Cosmetics sums up for me. My personal favourite from the Illamasqua campaigns (and there are a lot of beautiful images to choose from!) is this one from the most recent Spring/Summer Toxic Nature collection. It’s frivolous, powerful and total eye-candy in one crazy package. 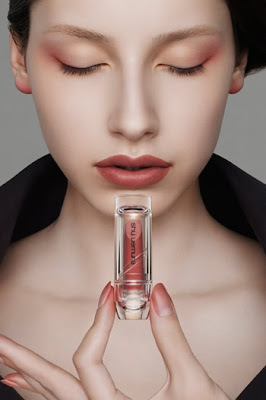 And finally, a classic from 2008 and Shu Uemura‘s Tokyo Lash Bar… I remember being quite awestruck at practically all the lash images released around that time from the brand. Amazing! Do you have some favourites? Would any of the above make your list? I LOVE that Givenchy dress and I also love pretty much all of the Becca promo images, especially because they show women in such a positive way. I’m so into all of the Toxic Nature pics. Also, I love the dress on the model in the Givenchy promo (I actually hadn’t seen it before!) The Shu Uemura one’s new to me, too. Lovely photos! I <3 the Toxic Nature promo pics, all of them. Good choices! You know you’re good at your job when your ad is instantly recognisable. I knew the last one was Shu before you said it because it seems that lashes are what they are most famous for. I think I’m a bit desensitised to the Illamasqua ads now, when they first came out I was always wowed by them but as they were SO good early on, I find myself wanting to be that wowed again but it hasn’t happened. The first one is my favourite though, especially how the eye colour and cheek colour bend together so effortlessly. I personally can’t stand the Illamasqua promo pictures. :S My absolute favourite ones are the recent Guerlain ones, basically anything with Natalia Vodianova, she is just so stunning! Also the 2008 Mysterious Butterfly (Guerlain) promo pictures were gorgeous too even though she wasn’t with Guerlain yet then. I love the Illamasqua promo images they are so striking and individual in comparison to other make up brnads. The art of darkness collection had some breath taking images and is my favourite to date. I LOVE the “READ ALL” button. Thank you for listening, we appreciate all your efforts. WOW, I totally didn’t see this before I posted the exact same image! Isn’t it a great one??? Details to notice – the SHADING! In red, on her eyes, but also check out her nails and her ear-lobes. That sort of attention to detail, along with the soft, perfect, but still interesting and unusual look has just had me in love with this image since I first saw it. I like all except the Illamasqua! 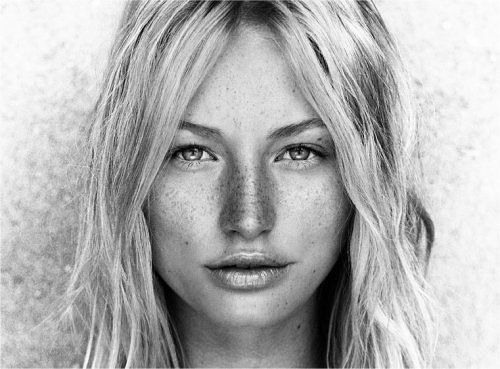 I’m totally with you on the Becca image- wish I had freckles while looking at that girl- she is naturally gorgeous. The Shu one I had never seen before- crazy lacey lashes, but I like it! Glad I found your site- can’t wait to look through all your posts!